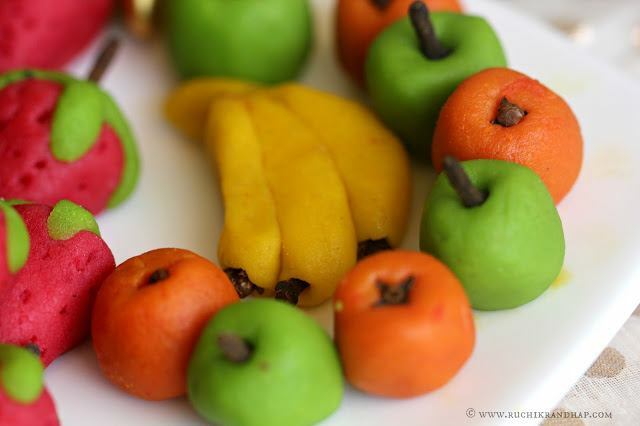 Marzipan is a quintessential Christmas sweet prepared in Goa and Bombay. 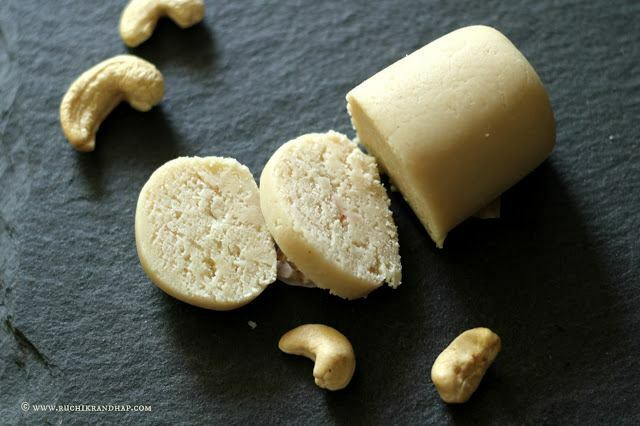 It is nothing but a thick paste of ground almonds (traditionally) or cashew nuts (in most tropical countries) which is used in the preparation of sweets (using molds of different shapes or free hand molding) or rolled up to drape cakes (similar to fondant covered cakes). 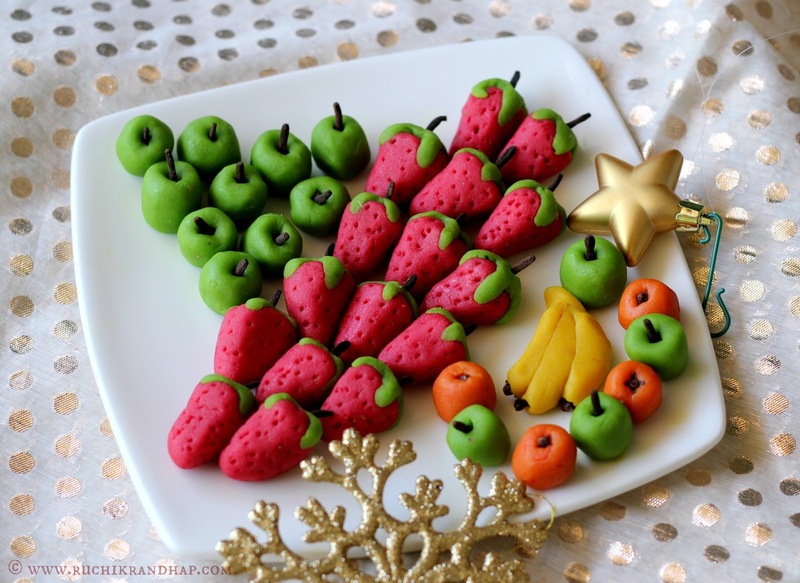 However, during Christmas in Goa and Mumbai the term ‘marzipan’ is synonymous to molded and coloured sweets that often take the shape of many Christmas symbols such as wreathes, bells, holly leaves, Santa’s face, reindeers or a variety of berries. The sweets are bite sized and most times extremely sweet. Food colouring may or may not be added although the latter results in attractive sweets suitable for the season. Although I have tried to make it over the past few years the result was never up to the mark. Getting the consistency of the sugar syrup and then cooking the paste of ground cashewnuts in it was such a tricky thing for me! I eventually gave up as I was in no mood to slave over recipes that weren’t accurate. This is when my dear Aunt Rosette came to my rescue and shared her lovely recipe with me. Thank you so much Aunty!! Her recipe is not just easy, the taste of the sweets is just right – the sweetness is not tooth tingling! The taste is velvety, creamy, nutty and it makes you want to eat one more and another one and another after that! This recipe needs no sugar syrup to be made. Just grind all ingredients together and cook it patiently over a low heat. Yes, like all good things that need a bit of hardwork, this sweet needs your patience and time too. But the end result is worth it I promise! I strongly recommend you try it when you have a couple of hands, undisturbed, on your hands. If you have little ones, get them busy in a place where they are safe and won’t disturb you. Once you begin to make it, you should give it your undivided attention. The first time I made these sweets I used different food colours and shaped them into little fruits. I didn’t have a mold then. This time I used the rubber molds that my aunt gifted me and off I went to create these little pieces of confection! I do hope you give this recipe a try. Do write in to me at ruchikrandhap@gmail.com if you have any doubts! Click to save this recipe on Pinterest! Soak the cashew nuts in a bowl of water for 4 hours. Overnight is best. Then gently rub each cashew nut to get rid of any extra skin. Rinse and drain on a colander. Grind the cashew nuts, sugar, egg white and rose water together to a fine, smooth & thick paste. Do not add any water. Transfer the paste to a wide, heavy based pan or kadai (this is a pre requisite or you may end up burning the marzipan if you use flimsy pans) and cook it on a medium low heat stirring every now and then to prevent scorching. About 35-40 minutes later you will notice that the mixture begins to leave the sides of the pan and will come together in a mass which will resemble a ball of dough (chapathi dough). Check for readiness by taking a small portion of the mixture and rolling it between your thumb and index fingers. If the mixture is no longer sticky it is ready. When the mixture is cool enough to handle, lightly grease your palm with butter or a drop of oil and knead it into a smooth and pliable dough ball free of cracks. 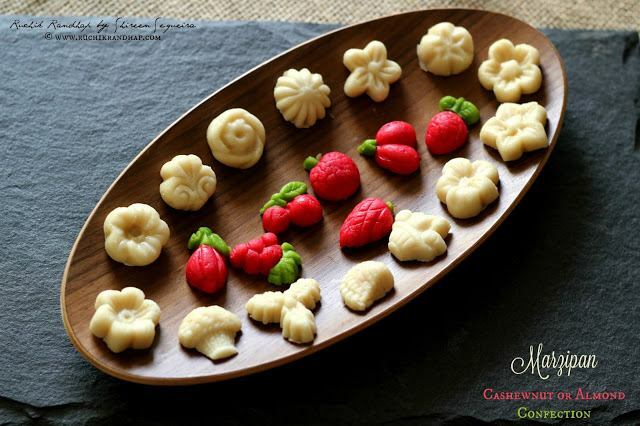 Keep the moulds to dry for 30-40 minutes or till they the marzipan feels cool to the touch. Then gently twist the moulds and pop the marzipan shapes out. Serve! 1. Marzipan is traditionally made with almond meal (almonds skinned and powdered) however in India, marzipan is synonymous with Christmas sweets and is famous in Goa and Mumbai. 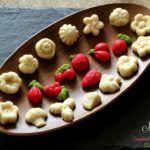 Cashew nut is the nut of choice for the Indian version of marzipan as it is locally grown unlike almonds which are usually imported and a lot more costly. 2. Use the best quality/fresh stock of cashewnuts that are fairly clean and white and not dull and yellowish. If cashwewnuts are unavailable you may use almonds. Just blanch them (place in a bowl and pour boiling water over them - cover for 20 mins and then peel off) before grinding. 3. 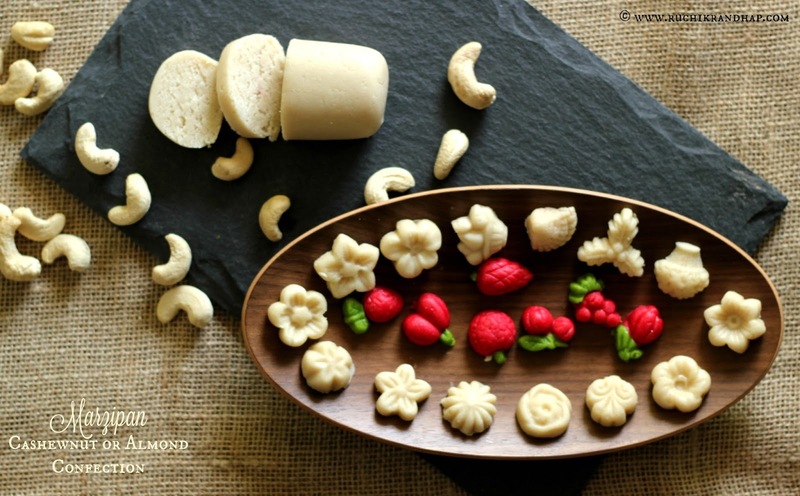 Most marzipan recipes call for sugar that is twice the quantity of the cashewnuts. I personally find it too sweet for my liking. This results in a mildly sweet and delicious marzipan. However, if you like, you can increase the sugar according to taste. 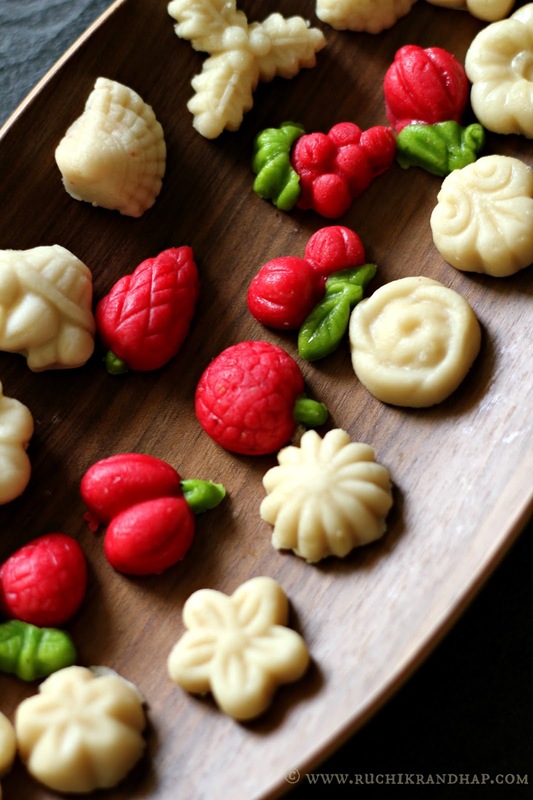 Do not judge the sweetness of the marzipan when it is still cooking. When foods are hot, the tongue cannot gauge the exact sweetness. 4. If you don't have moulds you can make freehand shapes of your choice. To colour the marzipan pinch out small portions of the dough (retain more of un-coloured marizpan always) and flatten into a disc. Add a drop or two of food colour at a time in the centre and fold the edges carefully towards the centre and then keep folding till all the portion has been coloured. This way you can avoid getting a lot of colour on your fingers. 5. 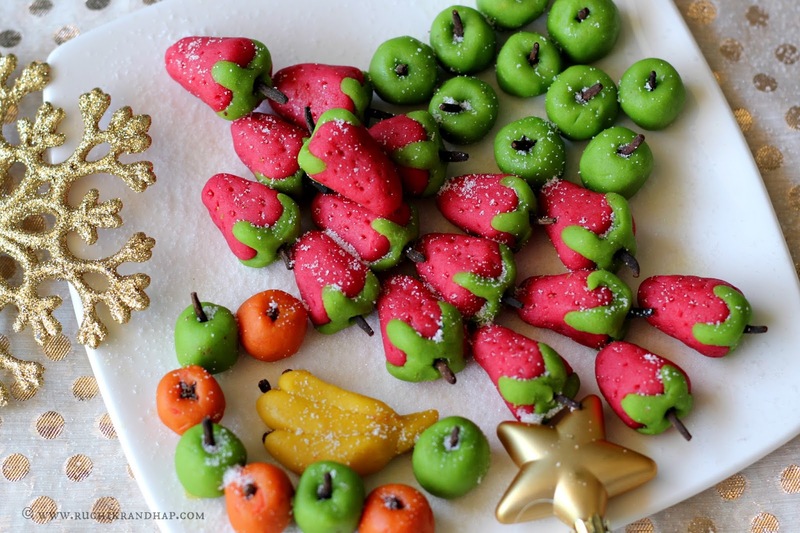 If you are using gel based food colouring (which is ideal) use a toothpick to draw out colour from the bottle and apply it onto the marzipan. 6. The dough has a tendency to dry up quickly and turn crumbly making it hard to roll without cracks. So in order to keep it smooth & pliable just pop it into a microwave safe bowl/plate and warm it up in 15 second spurts to keep it soft. Re grease fingers with butter, knead and you are all set to go! Can the egg white be avoided? How can we replace egg white in this recipe? Shireen first and foremost can you please let me know which website did you get your molds from. I've been searching for them quite sometime. Please don't tell you got it from Crawford market. Mazapin look droolious. Now you also can let Elton know you make them. Hi what can I replace the rose water with? Not fond of the flavor. Should I include the same quantity of plain water to retain consistency?